Jetex exhaust bends enable exhaust systems to be fabricated with ease. All Jetex Exhaust bends are. For a complete solution to one off, bespoke or individual exhaust systems. One end is flared and slotted enabling following exhaust sections to slide in and be clamped. Jetex Performance Exhausts, Since 1986. Performance Aluminised Steel Exhaust. A fitting kit is provided with every Jetex system. (see pictures). About Jetex Performance Exhausts. Sound reduction is a critical design concern with any exhaust system. 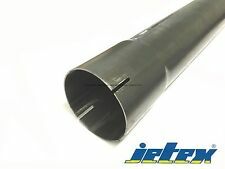 Jetex Universal Exhaust Tubing Bend 44.5mm OD, to 44.8mm ID. Jetex exhaust bends enable exhaust systems to be fabricated with ease. All Jetex Exhaust bends are. 30 Degree, Mild Steel. 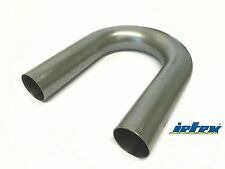 The exhaust bends are available in mild or stainless steel. Jetex Performance Exhausts, Since 1986. A fitting kit is provided with every Jetex system. (see pictures). VW Golf MK3 8v 16v GTI VR6 Jetex 2.5″ Cat Back Exhaust System Non Resonated with Twin Round 80mm Tail Pipes. Jetex Performance Exhausts, Since 1986. A fitting kit is provided with every Jetex system. (see pictures). VW Scirocco MK2 Jetex Performance 2″ Aluminised Steel Half Exhaust System with Round 80mm Tail Pipe EC ✔️. Genuine Jetex Item. VW MK4 Golf R32. Model - Golf MK4 R32. Tailpipe - Twin Round 100mm. Stainless Steel Resonated Exhaust System. Material - Stainless Steel. Type - Half System. Make - Volkswagen. Jetex Performance Exhausts, Since 1986. A fitting kit is provided with every Jetex system. (see pictures). VW Golf MK4 1.8T 1.9TDI Jetex 2.5″ Cat back Exhaust System Non Resonated with Twin Round 80mm Tail Pipes. 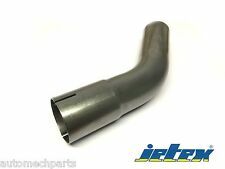 Jetex Universal Exhaust Over Axle Bend 3"OD to 3"ID Mild Steel. Jetex exhaust bends enable exhaust systems to be fabricated with ease. All Jetex Exhaust bends are. The exhaust bends are available in mild or stainless steel. Jetex Performance Exhausts, Since 1986. A fitting kit is provided with every Jetex system. (see pictures). VW Golf MK1 GTI Cabriolet Jetex Performance 2.5″ Stainless Steel Half Exhaust System with Round 80mm Tail Pipe. Jetex Performance Exhausts, Since 1986. BMW 320i 420i 2.0T Jetex Performance Stainless Steel Cat Back Exhaust System with Round 100mm L&R Tail Pipes. A fitting kit is provided with every Jetex system. JETEX PERFORMANCE EXHAUST. Model Golf Mk1. Fitting Point Downpipe. Tailpipe Round 80mm. Engine GTi all years Cabriolet up to 1983 ONLY. Type Half System. This is due to your location and the size / weight of the exhaust. Jetex Performance Exhausts, Since 1986. A fitting kit is provided with every Jetex system. (see pictures). Audi A4 B5 2WD Jetex Performance Exhaust 2.5″ Stainless Steel Race Pipe Performance Upgrade. Jetex Performance Exhausts, Since 1986. About Jetex Performance Exhausts;. Fits Golf MK3 2.0 8v/16v GTI & VR6 Only. Performance Stainless Steel De Cat Cat Bypass Pipe. Gains can be expected. VW Parts International. JETEX PERFORMANCE EXHAUST. Model Golf Mk3 8V/16V/VR6. Engine GTi and VR6. Material Stainless Steel. This is due to your location and the size / weight of the exhaust. Tailpipe Twin Round 80mm. Jetex Performance Exhausts, Since 1986. A fitting kit is provided with every Jetex system. (see pictures). Saab 9-3 2.0t 1.8t Jetex Performance Stainless Steel Cat Back Exhaust System with Oval Tail Pipe. Jetex Performance Exhausts, Since 1986. A fitting kit is provided with every Jetex system. (see pictures). VW Golf MK1 Cabriolet Jetex Performance 2″ Aluminised Steel Half Exhaust System with Round 80mm Tail Pipe EC ✔️. Jetex Performance Exhausts, Since 1986. A fitting kit is provided with every Jetex system. (see pictures). VW Golf MK7 1.2 TSI Jetex 3″ Stainless Resonated Cat Back Exhaust System with Twin Round 80mm Tail Pipes. Jetex Performance Exhausts, Since 1986. A fitting kit is provided with every Jetex system. (see pictures). Ford Focus MK1 1.8 2.0 Jetex Performance Cat Back Stainless Steel Exhaust System with Round 100mm Tail Pipe EC ✔️. Jetex Performance Exhausts, Since 1986. A fitting kit is provided with every Jetex system. (see pictures). Volvo S60 2WD Turbo Jetex Performance Stainless Steel Cat Back Half Exhaust System with Round 100mm Tail Pipe. Volkswagen Golf Mk6 1.4TSi 1.4TSi 09 Stainless Steel Jetex 76.5 63.5mm Back Box Twin Round 80mm Quad 40DB5DR. Part Number: 40DB5DR. Jetex are a leading supplier of performance exhaust systems. Jetex exhausts are made to reduce back pressure and increase torque and engine performance. Jetex Performance Exhausts, Since 1986. A fitting kit is provided with every Jetex system. (see pictures). Volvo V70 III AWD T6 Jetex Performance Stainless Steel Cat Back Exhaust System with Round 100mm L&R Tail Pipes. Audi S3 (8P) Quattro (07 ) 2.0L TFSI 265bhp Stainless Steel Jetex 70mm Back Box Twin Round 80mm 40-BBR. The following product is suitable for: Audi S3 (8P) 4WD 2.0L TFSI 265bhp 07 on. Engine: 2.0L TFSI 265bhp. Jetex Performance Exhausts, Since 1986. A fitting kit is provided with every Jetex system. (see pictures). Saab 95 Aero Turbo 04 on Jetex Performance Stainless Steel Cat Back Exhaust System with Single Oval Tail Pipe. JETEX PERFORMANCE EXHAUST. Model S2 (B4) Quattro. Engine 2.2 Quattro Saloon/Estate. Make Audi. This is due to your location and the size / weight of the exhaust. Material Stainless Steel. EC Approval Yes. JETEX PERFORMANCE EXHAUST. This exhaust ONLY fits the B6 "prefacelift" saloon and estate. Model A4 (B6) Quattro Petrol Turbo (01-05). It will fit all models of the B6 and B7 cabriolet models. Make Audi. Part Number: T41T2R. Jetex are a leading supplier of performance exhaust systems. Jetex exhausts are made to reduce back pressure and increase torque and engine performance. Each exhaust is designed specifically for each model to ensure perfect fitting and the right exhaust note.